A Cathal McShane last-minute point forced extra time against Meath last time out and Tyrone held on in extra-time to save their summer. 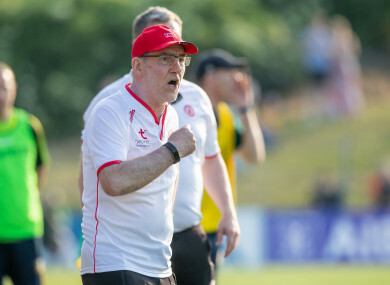 MICKEY HARTE HAS made four changes to the side that controversially defeated Meath after extra-time in the first round of the qualifiers ahead of Tyrone’s trip to Carlow on Saturday. All six forwards that started against Andy McEntee’s side retain their places but Harte has made a number of changes in defence and midfield ahead of their round two clash in Netwatch Cullen Park. Niall Morgan is back at number one after missing out in a last-minute change in Navan. Cathal McCarron returns at corner-back ahead of Hugh Pat McGeary while Ronan McNamee and Pádraig Hampsey keep their places. Tiernan McCann is out after picking up a straight red card last time out and is replaced by Peter Harte who returns from suspension. Harte will wear seven while Michael McKernan switches to McCann’s number five jersey alongside Frank Burns. Declan McClure will join Colm Cavanagh at midfield ahead of Padraig McNulty, behind a half-forward line of Mattie Donnelly, Niall Sludden and Connor McAlinskey. Richard Donnelly will start at full-forward with Pairc Tailteann hero Cathal McShane and Connor McAlinskey either side of him to complete an unchanged forward line. Saturday evening’s game will be Carlow’s first outing in the qualifiers after Leinster SFC wins over Louth and Kildare saw them reach the semi-final stage. A four-point defeat at the hands of Laois on 10 June saw Turlough O’Brien’s side into the second round of qualifiers. Throw-in is at 5 pm at Netwatch Cullen Park. Email “Mickey Harte makes four changes ahead of Carlow clash”. Feedback on “Mickey Harte makes four changes ahead of Carlow clash”.